Others may have different opinions but this is the way I saw things. I genuinely liked everyone on the walk and had many long and interesting discussions with everyone. Anything I say about anyone is purely in fun. Some information and photos I got from others on the walk. I may have enhanced some of the information I gathered. Anything that is blatantly incorrect please let me know. All photos referenced have been converted to a smaller size for faster downloading. Graeme organised the whole trip and he is to be commended for his efforts. Day 1. Dove Lake to Waterfall Valley. Climbed Cradle Mountain as a side trip. Camped in tents on grass. Day 2. Waterfall Valley to Lake Windermere. Camped in tents on wooden platform. Day 3. Lake Windermere to Pelion Plans. Stayed in Hut. Day 4. Pelion Plans to Du Cane Hut. Climbed Mount Ossa as a side trip. Stayed in tents. Day 5. Du Cane to Windy Ridge. Visited Hartnett Falls as a side trip. Stayed in Bert Nichols Hut. Day 6. Windy Ridge to Narcissus Bay. Camped in tents on grass. Day 7. Narcissus Bay to Echo Point. Camped in tents on sandy beach beside Lake St Clair. Day 8. Echo Point to Cynthia Bay. 75km plus about 8km for side trips to Cradle Mountain, Mount Ossa and Hartnett Falls. Graeme had a few surprises for us. First he carried an Australian flag on his pack all day. I did not see it until late in the day when someone pointed it out. Second, he gave Australian serviettes to everyone in the Bert Nichols Hut at Windy Ridge where we were staying. Third, we had pancakes for dessert. Graeme cooked the first round and then Noel took over. The smoke from Noel's efforts set off the smoke alarm in the hut. Everybody had three rounds of pancakes and there was one left. We gave it to a young girl who was hiking with her father and their Au-Pair. We also sang Advance Australia Fair. Katrina thought it was cold one night. She told me she had on 2 pairs of thermals, her coat, the hat of the coat over her head, a face mask and the sleeping bag zipped as far as it could go. That might have been the first night we camped when it started drizzling and the wind was howling most of the night. I got up to the toilet and nearly froze but I only had my jocks on. I was told water was not a problem and I also read this on the Tasmanian Parks website and in the Overland Track Bible ("Overland Track" by John & Monica Chapman). Don't need to carry more than 1 litre they said because you pass many streams and lakes. As it turned out all this was true but I was a little worried once. We did a side trip to Mount Ossa. It was very warm and if I had not been able to get water from a small soak about halfway up and a lake at the top I would have been in trouble. Passed one lady walking up Mount Ossa who was not carrying any water. When we got to the Du Cane Hut camping area the stream near the old hut was dry. Luckily, Graeme found a stream another few hundred meters further along the track. We took all our bottles and bladders there and filled them up. I suggest that walkers carry a full 2 litre bladder and another empty bladder as spare (which some in our group did). There are signs on all the hut tanks recommending that water be boiled or treated but none of us bothered. Neither did the ranger at Narcissus who told me she drinks water direct from the tank at the hut. Apparently Gastro has been a problem for some walkers. I suspect toilets could be part of the problem and everyone should carry and use small bottles of hand sanitiser. This is what Barbara said every time she heard Natasha coming behind. Natasha used hiking poles and they made a clicking noise touching the rocks on the track. Barbara said it sounded like pirate cutlasses. Some of the wildlife are pests as we discovered. During the night whilst camped at Windermere Lake, a possum scratched a hole in the side of Jason and Natasha's tent and dragged some scroggin out. Jason heard the noise and went outside to investigate and discovered the possum eating the scroggin. They repaired the tent with duct tape. They also used their duct tape to temporarily repair someone's shoes. I heard later that they took the shoes to a ranger and he repaired them. Apparently, rangers have extensive repair facilities in their huts. We left our packs behind when we climbed Mount Ossa. When we got back some Ravens had undone a zip on someone's pack and pulled out the scroggin. They then picked out the their preferred delicacies. We were told to keep food inside the tent and huts and this is what we did. Mosquitoes were noticed at most camps but were the worst at Du Cane. March flies were also noticed at most camps but were the worst at Echo Point. Rats were heard at Narcissus Hut and we were told there is a large black rat at Echo Point Hut. I saw three snakes. One small one scurried across the track. Another large one was waiting beside the track and we were lucky to see his head before we passed. The last snake was blocking the track up to the toilet at Echo Point. Natasha saw it first and wanted to know if it was a plastic one. In the evenings the wildlife would emerge to check you out. Most were looking for food. There are signs up everywhere advising you to not feed the wildlife. From the top of Mount Ossa. We could not have picked a better day to climb Mount Ossa. You could see for over 50km, 360 Deg. Could even see Cradle Mountain and Lake St Clair. Views from Cradle mountain were also very good. 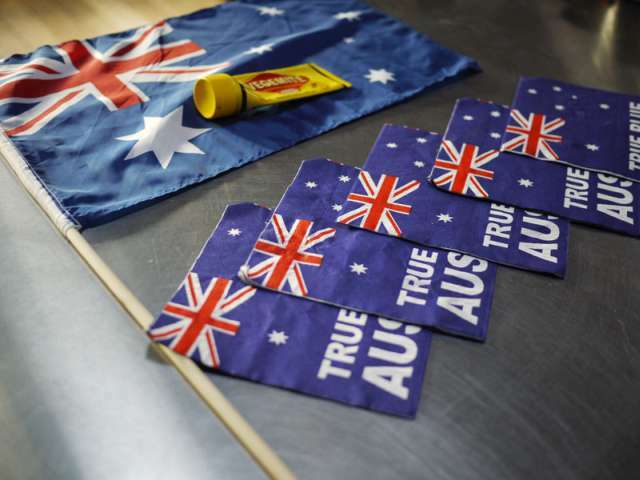 Graeme is very patriotic as evidenced by his antics on Australia Day. Peter ate a whole tin of plum pudding on our last night. I hope you don't get bored reading these notes. I am probably too philosophical. Jason is a good clapper. We observed him clapping for about half an hour at Echo Point. Initially, we thought he was chanting but he was actually killing march flies. Natasha is not her real name. Liana did not reveal any secrets. 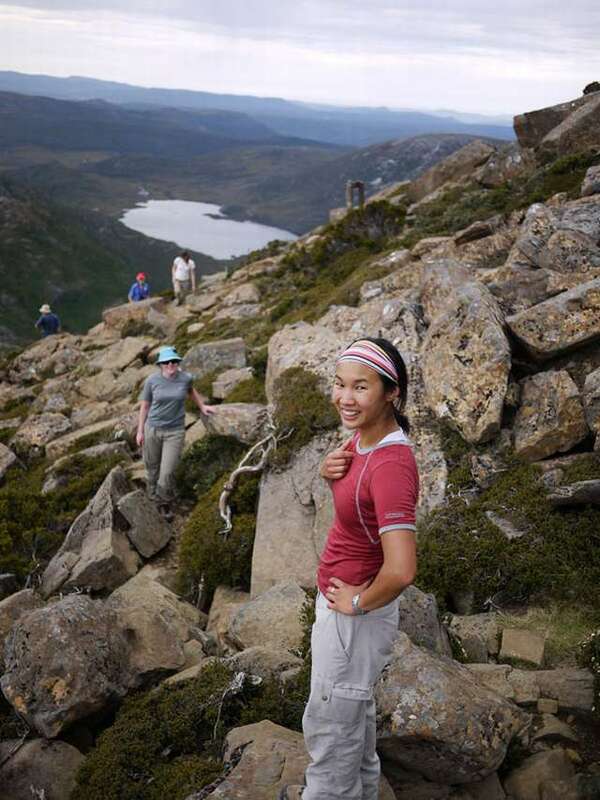 Katrina surprised us by bounding over the rocks at Cradle Mountain and Mount Ossa. She revealed later that she does rock climbing as a hobby. Barbara lives in the wrong suburb of Melbourne. When we arrived at Waterfall Valley Hut we were met by a couple who said they were volunteer rangers. They volunteer their services for a 10 day period to look after the huts and attend to walkers needs. Noel requested a cappuccino to be delivered to his hut at a certain time but it never arrived. I did see them wandering around talking to campers and cleaning the toilets. The real rangers can be useful sometimes. Near Narcissus, there is a suspension bridge and when I walked over it I got the ranger who was working on it to video me as I crossed it. Out first night was a worry because the wind howled and there was light drizzle. As I lay in the tent listening to this I was thinking that this is good start to our trip. However, the next day it cleared early. We only had a few drops one other day and the last morning about one hour of light drizzle. Graeme, who has walked the track many times, commented that this is the least rain he has ever experienced. Katrina's. It was exceptionally loud. We had three fuel stoves and all were used most nights. We carried nine bottles of fuel, one each. I believe we had about two full bottles left at the end of the trip. I got injured the most. Blisters on my feet and I hit my forehead rather hard on an overhanging log. Luckily I had a sweat band and a hat on otherwise I would have drawn blood. Out of nine in our party only three did not have any blisters (that they would admit too). Graeme injured his arm climbing up to Marion's lookout. We put a bandage on it. We heard about a young guy who twisted his foot in Pine Valley and was rescued by a Police helicopter. From Pelion Hut to Du Cane Hut. The side trip to Mount Ossa combined with a warm day made it difficult. I was stuffed by the time we got to Du Cane Hut. Barbara. Although she did not do all the side walks we did and was a little slower than us she made it to the end. I did not open my wallet for a whole week. Now that is unusual. I think we can all take credit for that as each of us cooked at some point on the walk. Those that did not cook washed up. Graeme did make the porridge every morning and also prepared delicious cheesecakes on two occasions. Walk into Pine Valley which was the original plan. At Du Cane, Graeme asked us if we still wanted to walk into Pine Valley. We were all a bit stuffed that day and the consensus was to not go into Pine Valley. I probably had the biggest influence on that decision because I was the most stuffed. Graeme purchased all the food and we each carried an equal portion of about 5kg. He did an excellent job and we had a wide selection to choose from. For breakfast we had porridge or muesli. For lunch we had dry biscuits with a variety of toppings including cheese, vegemite, jam, peanut butter etc. On the last day we had a gourmet lunch consisting of Gnocchi, Mushrooms, Couscous, Dutch Curry, Cheese, Tuna and Chicken. For dinner we had the following on various days - Gnocchi, Beef Stroganoff, Bombay Potatoes, Jaipur Vegetables, Pasta, Tuna, Chicken, Honey Soy Chicken, Roast Lamb, Beef & Pasta Hot Pot, Rice, Mashed Potato, Peas, Corn. For dessert had Apple, Pears, Apricots, Custard, Cheesecake, Plum Pudding, Jelly. Some evenings we laid out a selection on the table and picked out the best as this photo shows. Even after all this excellent food Natasha and Jason could not resist hamburgers as soon as we arrived at Cynthia Bay. Don't know what food was left at the end of the trip but we did have a lot of empty food containers to carry out. On the sandy beach at Echo Point. See this photo. Someone in our group pointed out that my shirt was on inside out. Another day I discovered that I had it on back the front. Ah well, dressing in a tents is awkward at the best of times. Letting Noel carry our tent for the last 1km on the day I was struggling. At the new Pelion Hut I went to the toilet in the middle of the night. When I got back and tried to open the door to get back into the dormitory I couldn't. The guy sleeping on a bunk near the door had his feet sticking out blocking the door. A gentle push did not move him but a harder one did. I don't think he even remembered it. Noel causing huge amounts of smoke whilst cooking pancakes in the kitchen of the Bert Nichols hut at Windy Ridge. He set off the smoke alarm so we moved him to another area with no smoke alarm. See this photo of him holding the smoke generating pan outside the door. Some of us on the Telstra NextG network got reception at the top of Cradle Mountain and Mount Ossa and were able to make phone calls. Others with 3 and Optus got nothing so we let them use our phones. We played UNO one evening in the hut at Windermere Lake. Other times we soaked up the views from Pelion Plains Hut or Bert Nichols Hut. Some long days meant that we were still cooking or cleaning up very late. Most evenings we were in bed by 9.00. At Du Cane, the mosquitoes forced us into the tents. Peter, Liana and Katrina plunged into the water in the pool above Hartnett Falls. It was very cold they informed us. At Echo Point, the above three and Natasha had a swim in Lake St Clair. See this photo of a few of us sitting on the jetty at Echo Point. It was difficult to have a good body wash on the walk and swimming does refresh you. At the Bert Nichols Hut at Windy Ridge some of us did some clothes washing. There is an internal drying room there which was put to good use. The two newer huts on the track are the new Bert Nichols hut at Windy Point and the new Pelion Plains Hut. We stayed in both. They all had heaters but they don't want you to use them as this photo at Bert Nichols Hut shows. The sign mentions coal but is out of date as they now use wood. The huts at Waterfall Valley and Pelion Plains have gas heaters. The Bert Nichols Hut had an information sheet stuck on the wall in the kitchen raving about its innovative design features. There was a viewing platform beside the hut with great views of Mount Geryon and The Acropolis. Overall it was a good hut except for couple of things I noticed. I was amused by the fact that the hut had an internal smoke alarm and yet the underneath of the hut was jammed with firewood. Firewood underneath or beside a building is a big no no. The sleeping area was very noisy. Some other walkers arose very early and the wire grates in the corridor and self closing doors made a lot of noise. It was a long walk to the toilet. The boardwalk wound its way around the back of the hut. The route could have been shortened. The new Pelion Plains hut was not noisy and the toilet was closer. It also had a veranda all the way around. The views to Dean Bluff (particularly near sunset) whilst sitting on the veranda were lovely. Most people don't walk the track around Lake St Clair which is part of the Overland track. They stop at Narcissus and catch the boat back to Cynthia Bay. One young Dutch girl I spoke to at Narcissus told me she had done enough walking. When I mentioned that the Overland Track does not actually finish at Narcissus but at Cynthia Bay she did not seem particularly interested. The guy at Pelion Hut who was boasting that he got onto the Overland Track via a route where he did not have to pay any Park fees. A few kilometres before Windermere Lake, Barbara forgot to pick up a small bag she put down whilst taking a photo. Luckily, she remembered where she left it and when two of us went back to get it we found it easily. Prior to this we had asked other walkers who passed through if they had seen it. Nobody had and when we found it we could see why. It was located on the side of a step in a dark area. Barbara showed her appreciation at the visitor centre at Cynthia Bay when she shouted us drinks and chips. See this photo. At the Bert Nichols Hut at Windy Ridge. See this photo. A man with a young child in a baby carrier on his back near the top of Mount Ossa. A young guy wearing a kilt. Also saw him at a shop at Derwent Bridge (still had his kilt on). A guy and his young son having a cup of tea near the top of Mount Ossa. The toilet facilities along the track were excellent except at Du Cane Hut. Du Cane Hut had a hole in the ground with a wooden top and cover. You signalled that the toilet was engaged by moving a flag located beside the track to the toilet from one location to another. The other toilets were all composting toilets and very salubrious inside. See this photo of a typical toilet. The ones at Echo Point and Waterfall Valley were large enough to sleep inside (why would you do this?). The liquid is drained through the solids into a holding tank whilst the solids decompose. The liquid is periodically pumped (by the Ranger) into large sealed fibreglass containers and taken away by helicopter which is a very expensive operation. You may you think I am obsessed by toilets but Noel insisted on getting this photo taken. I like to take photos of signs (with me in it). I could see that the others were getting a bit bored with this but towards the end they were actually finding signs for me. Close to Cynthia Bay the signs became a bit flash so I didn't bother with these. Here is the collection of sign photos. Ironically, when we did the group photo everyone insisted that the sign be included even though you cannot read it. Maybe my sign paranoia rubbed off. At Narcissus Point, Graeme prepared two cheesecakes which he placed in the cold water near the edge of the lake. They were to be left there for a few hours to set. After dinner, we all had our tastebuds ready for them but when he went down to collect them one was missing! At first we thought someone had stolen it but an extensive search found it floating down the lake about 50 meters away. It was still intact and was easily recovered. Meanwhile, Liana had walked further down to the jetty looking for the cheesecake. She asked some campers there if they had seen it and they must have felt sorry for her because they gave her another one. This was our cheesecake for the next night. This time Graeme placed them inside a small stream flowing into the lake so they could not float away. See this photo. Barbara. She likes talking to people. You tend to see the same people along the track and everyone got to know her and that she was with our group. We even had people reporting to us where she was. I estimate that some of us were carrying up to 25kg extra if you take into account tents, fuel, water and hiking boots. Probably the best in Australia and one of the best in the world. You meet and talk with many people on the track. In particular, lots of walkers from overseas. All those I spoke to were extremely impressed. The strict controls, environmental considerations, variable weather, excellent facilities, variety of terrain, wildlife and many other factors all make for a great walk. I did not like people using it as a racetrack. We saw a lot of them. Jogging with a small daypack, they attempt to run all the way. Apparently, the record is 7hr 21Mins. These people are not in the least bit interested in the scenery, wildlife or anything else, just how quickly they can get from one point to another. 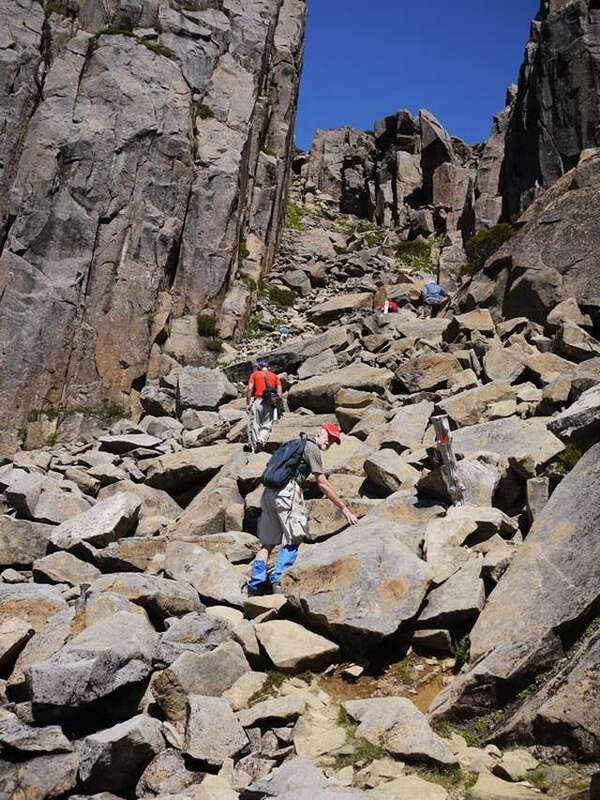 The Overland Track is a wilderness walk and allowing people to do these kinds of activities degrades it. It should be stopped. I did not see or hear any, but scenic helicopter flights over Cradle Mountain as far Lake Will are available. If you are walking in the wilderness soaking in the atmosphere of the pristine environment there is nothing more annoying than the "Wop Wop" of a helicopter flying overhead. I can accept helicopters performing a rescue or other important mission but not for tourists to fly over. 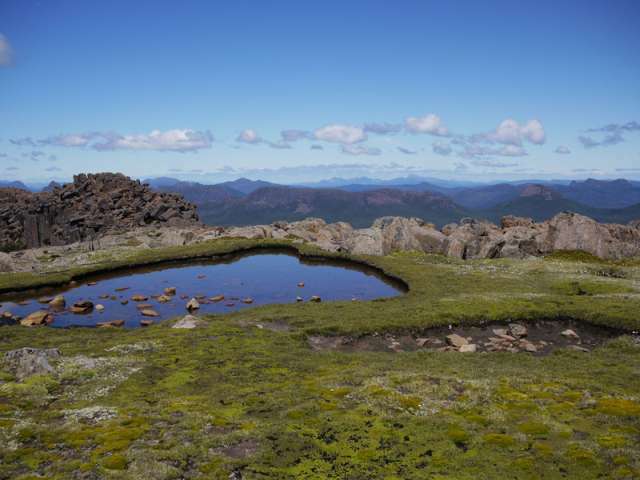 It is just not possible to appreciate the Overland Track and its sights by flying over it and it annoys people who are appreciating it the real way. It should be stopped. I reserve judgement about private huts. 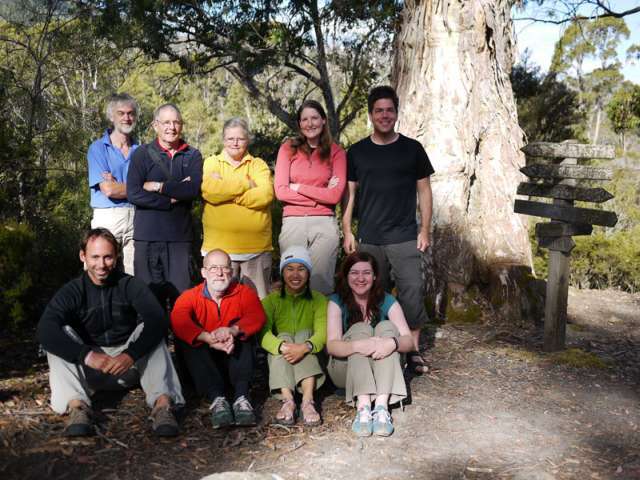 It seems they fit in with the environment and don't detract from the philosophies of the Overland Track. The problem is that the management of the Park is expensive and private huts (and scenic helicopter flights) help defray these costs and sometimes the Park management are pressured into accepting more from these people than they should and thus giving them some preferences. If the things mentioned above degenerate in the future and protests are necessary then I volunteer to run naked on top of Mount Ossa with an appropriate sign across my privates. Noel wanted someone to run naked at the top of Mount Ossa. He said it was some sort of tradition. Nobody volunteered at the time but he never fully explained the tradition and there was nothing to protest about. To everyone on the walk. It was a real adventure and it was my first real bushwalk.